Wee Blue Swirls: It's snowing.......somewhere! I hope everyone's week is going well so far. Christmas is only 260 days away so I thought I better start making my cards -haha!! I actually love making christmas cards and after taking a break from them since January I thought it was about time to start up again. Here in Australia we have just put our clocks back so the evenings are dark and winter is approaching...so its feels like a good time for some wintry makes....even though it never gets that cold! Sigh.... being a Scottish girl I just can't get used to Winter in the middle of the year and Christmas in the summer! Anyway for this card I used one of my all time favourite winter stamps from LOTV. They have a huge collection of seriously cute winter and Christmas stamps and I own alot of them. This darling stamp is called Snow Cute. 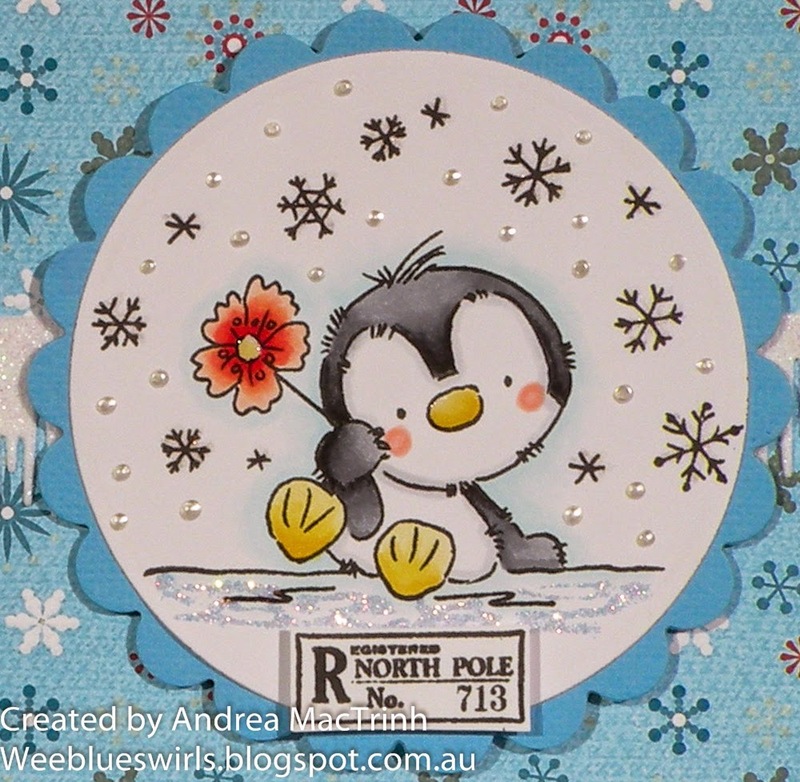 I coloured the wee penguin in with my copics and added some glitter glue under the image for some icy snow and some liquid pearls as snowdrops. It was then a case of just layering him up with some DP and glitter cardstock and the addition of an icicle border. Thanks for visiting, take care. This is a fabulous Christmas card, such a cute image and pretty papers. This is totally cute I LOVE the colours too! and Great to see you at ABC Christmas challenge too! yay! 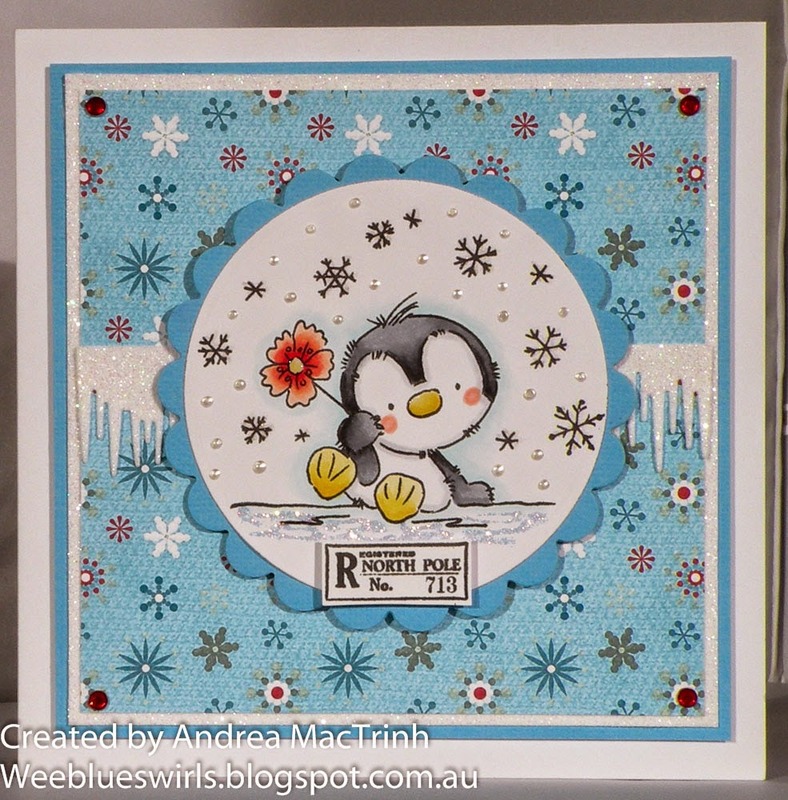 Such a lovely and cute Christmas card, Andrea, beautiful colours and card design. Thanks for joining the G for glitter challenge at ABC Christmas Challenge. Look at you getting a good jump on the holiday season!! Super cute card!! Thanks so much for joining our challenge at Papertake Weekly!